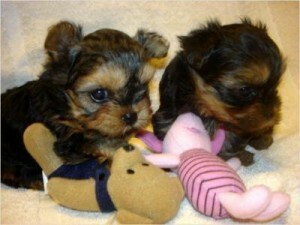 They are very sweet and loving Yorkshire Terriers and are very good with people. I recently got stationed here and had to move into an apartment but they need room to run and play and they just doesn't get that here. I don't want my burdens to fall on them so would like to give them away to a home with a yard and a place where they'll get lots of attention. They are house broken and up to date on all shots. They'll come with a large crate.